Here we go again in southern Louisiana. It’s Mardi Gras season. The out-of-town visitor probably asks: What is Mardi Gras? Perhaps elusive to someone not from Louisiana. Over the years I’ve learned so much about the essence of Mardi Gras; this is my take on the traditional carnival season as well as alternative new. Let’s start with the alternative new. 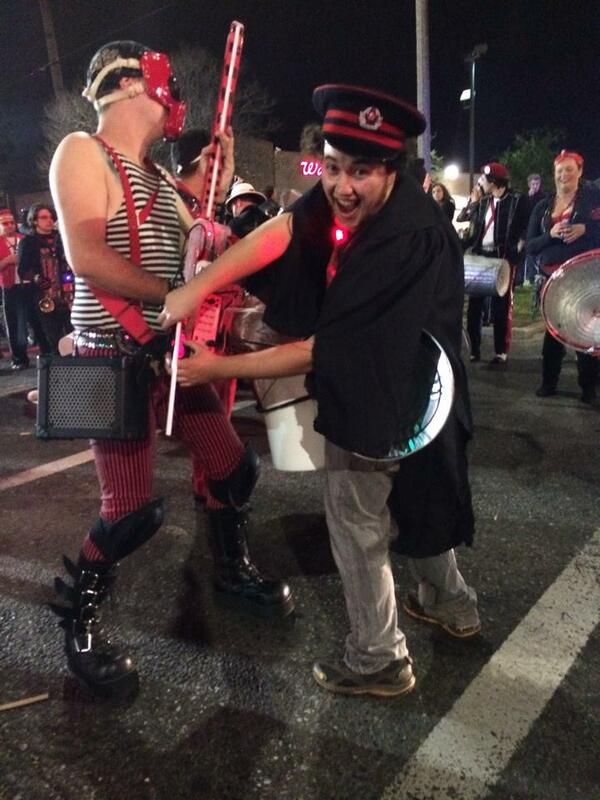 Here is my son is parading in the Noisition Coalition in this year’s Krew of Chewbacchus’ parade. The group makes all their own musical instruments–his is a can with duck tape for drum head; the group’s leader spent alot of time perfecting the instruments. Most of them are quite novel and creative. Compare it with the traditional Krewe and heart of carnival season. This beautiful young lady in her elegant costume is the queen of a Mardi Gras Krewe. Her float is accompanied by a court of young maidens in the krewe’s parade in Metairie. I took the photo in 2001 and no longer remember what parade or krewe it was. It is one of my favorite photos because it captures the pageantry that goes along with the carnival season. What Is Mardi Gras and Traditional Carnival Season? The celebrations have grown in modern years into the carnival season which consists primarily of parades, balls and parties. The parades and balls begin with the Twelfth Night or Epiphany on January 6 and end on the Tuesday before Ash Wednesday, the date varies depending on the calendar; always six weeks before Easter. The reason that Mardi Gras is so elusive to visitors is that traditional carnival season is essentially a series of parades in the weeks (primarily weekends) leading up to the day of Mardi Gras. Not a single activity; but many parades that come and go in a relative short time span. Don’t get me wrong. The parades in New Orleans and suburbs draw huge crowds, the floats and costumes are impressive, and the beads and throws tossed from riders on the floats are numerous, and the parades are lots of fun to attend. Really an “outing”. Worth attending if you don’t mind crowds. The parades are duplicated in towns across southern Louisiana. However, the Mardi Gras celebration in rural Cajun Louisiana is quite different–totally unrelated to the events I’m talking about. The parades are organized and hosted by krewes. These large, social organizations are by private membership only and are exemplified by Endymion and Bacchus. The krewes select the king and queen, royal court for the season with some of the krewes having celebrity royalty each year. The balls and costumes are elaborately staged, as shown in the above photo. The balls are primarily for their own members, not the public. In recent years exceptions exist. With Bacchus, for example, tickets can be had for the ball in the Morial Convention Center. After the public parade, the entire assembly of floats circles the interior of the convention center twice for those attending the ball. You don’t have to be a member of a krewe to enjoy Mardi Gras. It’s the essence and spirits that counts. Take in the sights, dress in a costume, decorate your house. 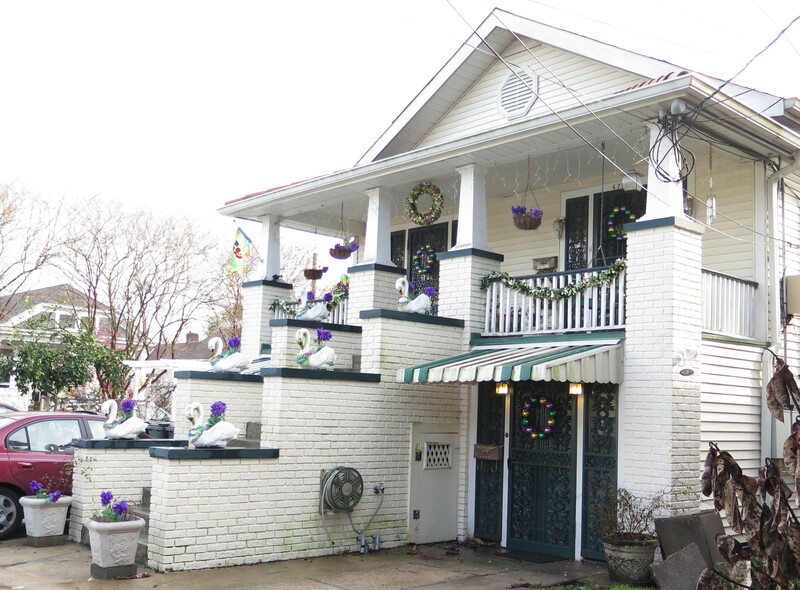 Here is a house in the mid city of New Orleans that I passed recently which seemed to catch the spirit. The swans appear as if they are ready to parade. Of course you can go to the French Quarter, too. Costumes galore and for any taste. Parades stopped winding through the French Quarter in 1972 because of the narrow streets and obstructions. The streets are so crowded these days. I went to the French Quarter during Mardi Gras after first moving here, took in a dinner at Antione’s, a traditional New Orleans restaurant with menu in French, saw the sights. However, I might think twice about going now; Take care if you go. All the celebrating is culminated on Fat Tuesday or Mardi Gras Day. The two krewes with parades that day are Zulu, an traditional black krewe, and Rex, the second oldest social organization to parade. After these parades wind through the streets during the morning, a series of truck floats–consisting organizations of families of all ages–follow. Lots of costumes, beads, revelry and fun. That night the courts of Rex and Comus meet at the ball of the Mistick Krewe of Comus to end Mardi Gras. At the stoke of midnight, mounted New Orleans police come to the French Quarter to end the celebrations there, I’m told–haven’t seen it myself. The Krewe of Rex is steeped in tradition. It was formed in 1872 by a group of business men as a way to promote tourism and business after the Civil War and as a means to host the Grand Duke Alexei Alexandrovich, the Grand Duke of Russia, to New Orleans. The Grand Duke accepted the invitation as he secretly wanted to hear his favorite opera singer, (who was scheduled to be in town), sing “If Ever I Cease To Love.” The Grand Duke sat in stadium seating as the parade went by. All the bands that passed by him played the song, which is now the official Mardi Gras Song. 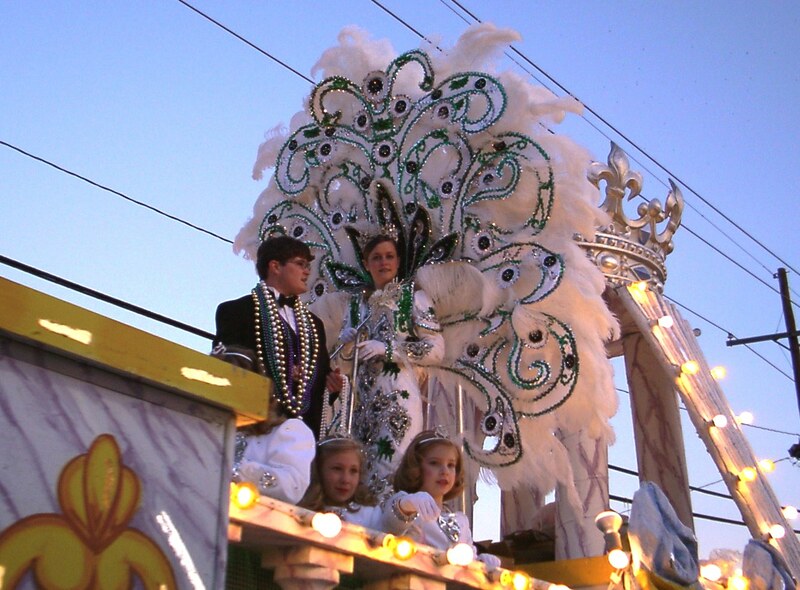 The Krewe of Rex also originated the traditional Mardi Gras colors of purple, gold and green. The monarch of Rex is always a prominent New Orleans business man, quite an honor. 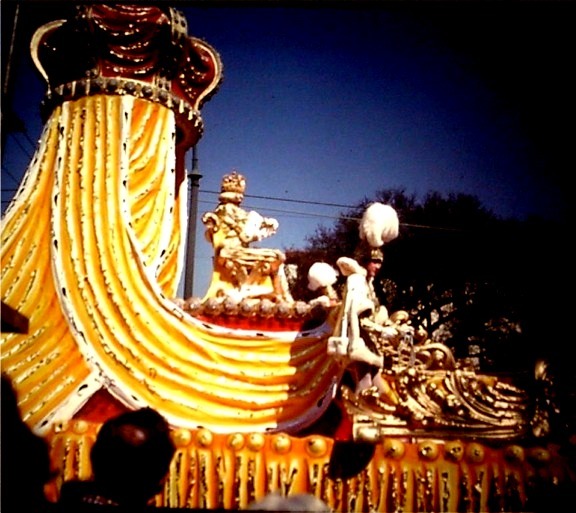 Here’s a photo of the Rex, “King of Carnival”, which I took in 2001. A little fuzzy, but still captures the essence. In recent years alternative krewes have started up for us ordinary citizens offering membership for a small fee. Often the krewes are satires on themes, the pageantry is full of fun and merriment–kind of a full circle–as the original celebrations in the 1800’s were unorganized and often chaotic. The krewes have their own parades as well as marching at the start of organized parades. These krewes include the Krewe of Cork–heavily into wine; Krewe of Barkus–heavily into dogs; Kewe of ’til Rex–into really small floats; and Intergalactic Krewe of Chewbacchus–heavily into science fiction. Perhaps you’ll catch my son’s Noisition Coalition parade group this year. If so give him a shout out. Anyway, I can never get enough of the Mardi Gras parades myself–perhaps I’m a little crazy. It’s a once a year event and who doesn’t want to have a good time. Perhaps not the French Quarter, but then the parades are in other parts of the city. See you there! This entry was posted in Louisiana Culture and tagged Chewbacchus, Krews, New Orleans Mardi Gras by Maylee at Beyond Gumbo. Bookmark the permalink.